Super Powered Creations For Hyperactive People! Announcement WELCOME TO PINK AVENGER! Kitties, glitter, and mayhem, oh my! Here you'll find everything from handmade couture and vintage clothing, fine art, jewelry, to fun and fancy stuff to decorate your home with! Keep checking back for new things that may pop out of my hyper brain! Add Pink Avenger to all your stuffs & keep updated with all the latest super news! Send me your ideas! I can make nearly anything your imagination can come up with!! So I got this beanie to use as part of my aged up Finn the Human cosplay and honestly I AM IN LOVE!! Its so super cute and the quality is amazing, incredibly comfy, fits my big head (I have a hard time wearing hats cuz of my head shape and hair style qwq), and it even had a little moon charm sewn into the side of it 💝 super cute!! I absolutely love this and will hopefully get to use it outside of cosplay as well! I got to make an all gold netted glitter kitty hat recently, it was so sparkly! Gold glitter yarn, gold sparkly tulle netting sprinkled with gold Swarovski crystals that pins in the back with a big AB heart crystal in a gold setting. So glam! Here's a close up of one of my new hand engraved tags in action! Each one is a little different! Pumping out SO MANY kitty hats again this week! Thanks to all the new people who found me! 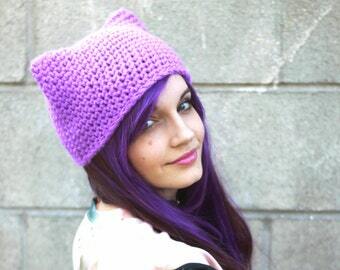 I'm working around the clock to get things out (1 week or less for made to order items), so if someone is looking for a #pussyhat send them my way! Meow meow meow! Super-powered creations from a hyperactive mind! Since I was a wee kid, I haven't been able to stay away from arts and crafts supplies for more than a day. Whether it's crocheting a scoofie, painting an undersea adventure, sewing a super awesome costume, or creating an armful of sparkly and brightly colored jewelry, where ever it is you're sure to find me up to my elbows in some creative endeavor! In 2006 I stumbled across the amazingness that is Etsy and couldn't resist taking the plunge and starting my own store. Beginning small, I started selling neon plastic bangles and random little crocheted accessories and got hooked on the rush of sending off my handmade goodies across the world. Soon after I came up with a swell idea, the scoofie! Scarves with hoods? Why hasn't anyone done this before?! The following few years became consumed with frantic crocheting, making a sea of scoofies to scatter across the globe. Over the last few years I've incorporated more vintage pieces from my hunts, occasional paintings, and home accessories. Everything I make is made with tons of love and all the vintage is something I adore and want to share with a lucky customer. A lifelong artist, I love creating! From crochet, sewing, painting, jewelry design, and expert bedazzling, I can't get enough! When I'm not making things for my store you can find me around LA freelancing for photography or celebrity costume design. Hi, I'm Rhea and I like to make stuff! Lots and lots of stuff! All vintage and custom items are final sale. Detailed measurements and descriptions are provided for each vintage item so you can get the best idea of whether it will fit you correctly. Compare the measurements with a similar article of your own clothing that fits great! Be sure to thoroughly read the description to make sure it's going to be perfect for you. Refunds for other items are reviewed on a case by case basis, but requests must be made within 72 hours of package arrival. PayPal and all major credit cards are accepted thru Etsy's secure payment system. It's super easy, instant, and secure! Electronic check transfers from your bank thru PayPal may take a few days to complete. Please allow a couple extra days for these orders to process before your wonderful goodie ships. My shipping days are typically Tuesday and Friday every week for domestic orders within the United States, Friday for international orders. Every order is shipped first class via the United States Postal Service unless otherwise noted in the item's description. All US order have super awesome tracking numbers so you can track the progress of your package across the country! Each item is carefully wrapped to guard against damage while in transit. Jewelry is shipped in super cute, reuseable and giftable packaging. I love custom orders! Feel free to message me with any ideas or questions you may have. I've made HUNDREDS over the years with oodles of happy customers. Your imagination is the limit! For custom orders, payment is required up front. Orders are usually ready to ship in a week after receiving payment. If there's any exception, such as in crazy busy times like Christmas, I'll give you a forewarning of the expected ship date before setting up the order.